China is changing. The past several decades have seen immense booms in the countrys demand for energy, steel, water and other natural resources that were already in scarce supply, in a country that is almost the size of the United States but has more than four times the population. Worries over the giant nations need for oil peaked with the U.S. and Chinese governments strange dance over Unocal last summer (see Geotimes, August 2005), and with Chinas consumption of steel, which sent the American government into a defensive stance several years ago. 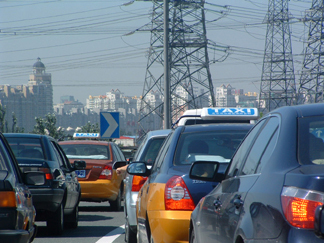 Demand for cars and energy is steadily increasing in China. The total number of privately owned vehicles reached 13.65 million in 2004, of which 6 million were privately owned cars; that number is up 12 percent from the year before, according to Chinas National Bureau of Statistics. Chinas electricity needs have also boomed, creating more demand for coal. Photo by Erik R. Hagen. As China continues its economic metamorphosis into the gorilla in the global sandbox, it has rapidly changed its physical environment. Home to some of the worlds largest cities, the country contains several of the most polluted cities in the world, partly because of its reliance on coal for energy. Wood and water needs have led to increased erosion and desertification, and the country sends dust from its quickly growing western desert across the Pacific, carrying sulfate and other polluting particulate matter. Yet as the most populated country in the world moves ahead with its ambitious economic-growth agenda, it is also taking steps to address environmental impacts of that growth, sometimes in unexpected ways. Emblematic of the scale of its environmental issues and the will that can be applied to fix them, the government is transforming Beijing, one of Chinas most polluted cities, for the 2008 Olympics. The effort illustrates some of the opportunities and the challenges of Chinas environmental situation, says Ruth Greenspan Bell, an international development expert with Resources for the Future in Washington, D.C.
Chinas environment minister has promised that the capital citys notorious smog would be cleared before the world gathers for the games. The government continues to raze centuries-old neighborhoods, fueled by coal stoves, to replace them with massive high rises that have more emissions-efficient heating systems. Some of Beijings industrial sites have been forced to relocate outside the city, shifting their pollution elsewhere. The government also initiated a massive tree-planting campaign several hundred kilometers from the urban center, to the west of the city, in an effort to slow the desertification of the region that has led to intense dust storms that pass through Beijing. Since the Great Wall was built around 1000 B.C., massive human impacts on Chinas landscape have been the norm. Migrating populations that settled in southern China a millennium ago, for example, deforested the region that was once home to the soon-to-be-extinct South Chinese Tiger. The forests in the south, where its tropical and semitropical, were extensive until about 1,000 years ago, says Walter Parham, a geologist affiliated with the Federation of American Scientists in Washington, D.C., who has used paintings from the 1700s and 1800s to show that treeless hills and erosion were widespread even then. Now only about 10 square kilometers (4 square miles) are left of South Chinas native forest. Local governments have been planting nonnative fast-growing trees such as eucalyptus, as well as grasses and other plants to halt erosion. The loss of agricultural land  tens of millions of hectares over the past decade, according to the Chinese government  is drawing rural dwellers into the cities, lured by the industrial economy that is now running full steam ahead. Megacities that house millions of people might produce only several items  such as Datang, one of Chinas sock-producing cities, or Wenzhou, which makes most of the metal cigarette lighters in the world, both south of Shanghai. 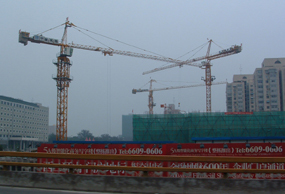 The growth of Chinese cities has concentrated the largest construction cranes in the world, particularly in Beijing, shown here. Photo by Erik R. Hagen. To fuel that industry, China needs power, on a huge scale. China is very poorly endowed with natural resources, with the exception of coal, says Nicholas Lardy, a senior fellow at the Institute for International Economics. About 60 to 70 percent of Chinas energy comes from coal. The countrys coal consumption outstrips the rest of the world, and is projected to increase by 50 percent while the rest of the world drops by 15 percent, according to estimates by the U.S. Energy Information Administration (EIA). In addition to coal, hydropower and damming have provided electricity necessary for industrial sites. According to the International Rivers Network, more than 20,000 large dams more than 15 meters (49 feet) tall sit on many of Chinas rivers. The Chinese government, which is in a mega-projects phase according to many analysts, is still in the process of building the Three Gorges Dam, which will be the largest dam in the world once completed in 2009, providing more than 18 gigawatts of electricity to six provinces, according to the U.S. Embassy (see Geotimes, August 2003). In the end, more than 1.3 million people could be displaced, in addition hundreds of villages and towns flooded for a reservoir that will be about 550 kilometers long, an area several times the size of Washington, D.C. Despite such dramatic water infrastructure, China still does not have enough water to meet its needs in the north, which has severely depleted groundwater stores. To help with the water supply problem, the government has decided to reverse the flow of some of its rivers, spending more than $59 billion on three canals, each more than 1,000 kilometers long. Accompanying engineering efforts will link the countrys four major rivers (including the Yangtze), which generally flow from north to south  reversing the flow of water from the south to the north. The Chinese Embassy in the United States projects that every year, 44.8 billion cubic meters of water will be channeled from the Yangtze to northern China. According to the Xinhua News Agency, the Yangtze River Water Resources Committee projects that more than 200,000 people, most of them farmers, will have to move to make way for the middle canal alone. Some of these large-scale changes have yet to occur. More immediately visible may be the issue of air quality, one of the biggest worries for China before the Olympics. Over the past 50 years, Beijing has suffered the onslaught of anywhere from five to 15 dust storms a year (see Geotimes, June 2004). These storms deliver thousands of tons of dust, lifted from the desiccating northwestern plains, where demand for water, wood and agricultural land have decimated the forests and grasslands that used to keep the soils in place. Sulfates and so-called black carbon  elemental carbon that contributes to global greenhouse warming because it absorbs and traps heat from sunlight in the atmosphere  as well as other kinds of particulate matter are carried by the dust storms. Scientists have tracked the dust all the way to California. Along with dust, China has been creating acid rain that affects its own land and the countries surrounding it. The impacts may be most evident in soil acidification of forests, particularly in Chongqing, as well as in the South China Sea. The Chinese government has a 10-year plan in place to reduce acid rain by controlling sulfur emissions through tracking the quality of coal burned. But that could prove difficult, partly because despite the Chinese governments ability to create massive changes, it also has a difficult time tracking what occurs at the local level. Researchers from China and the United States, led by David Streets of Argonne National Laboratory in Illinois, have shown that carbon dioxide and methane emissions took a dip at the end of the 1990s, as China took efforts to cut back on its coal burning  even as other countries steadily increased their carbon dioxide output. Those efforts included shutting down small mining operations in the late 1990s, and tracking what kind of coal larger mines shipped and in what quantities. But small unregistered rural mines remained active, says Jonathan Sinton, a scientist with the China Energy Group at the Lawrence Berkeley National Laboratory in California. The government data show a big gap between production and consumption, Sinton says. Also, tracking the quality of the coal is difficult, with implications for emissions estimates, which are made directly from energy statistics reported to various Chinese bureaus. EIA says that Chinas carbon dioxide emissions started to increase again in 2002 and 2003. The Chinese government has endorsed emissions trading schemes adapted from U.S. systems to control sulfur emissions, Bell says. However, she and other observers question whether such plans are appropriate, in view of Chinas weak record of tracking emissions and enforcing pollution controls, she says. In the meantime, massive environmental impacts are sparking environmental awareness among Chinas residents. In the fall of 1999, 2,700 ducks from farmer Zhang Jinhus flock, living in the Huai River in Hairou County, Beijing, died from the changing pH of the river. Zhang successfully sued the Gaoliang River Aquatic Farm, raising awareness of the problem of alkaline wastewater discharges. Zhangs path-breaking case was represented by a volunteer law group in Beijing, the Center for Legal Assistance to Pollution Victims, which works to bring such issues to court in cases structured like tort actions in the United States, seeking damages from the effects of pollution. But current environmental laws require that a victim must bring the lawsuit, unlike in the United States, where cases may be brought for the public good, often by environmental activist groups, such as the Natural Resources Defense Council and Sierra Club. Observers say that China may never allow such lawsuits, and meanwhile, its governing bodies are in transition. The central government is attempting to distribute some of the environmental responsibilities once consolidated in Beijing, but it has difficulty tracking what local governments might do. Although the local environmental protection bureaus ultimately are responsible for enforcing what the Chinese State Environmental Protection Agency decrees, they must report to provincial or local governments that control their finances. Those local governments may be run or influenced by owners of industrial sites, says Jennifer Turner, coordinator of the China Environment Forum at the Woodrow Wilson Center in Washington, D.C. And the local bodies may do what they think is best for the economy of a region, but not necessarily for its environment, says Wen Bo, a Beijing-based environmental activist who is affiliated with the Global Greengrants Fund in Boulder, Colo., and who works with Pacific Environment to develop environmental nongovernmental organizations (NGOs) in China. The [central] government knows whats going on, but is not necessarily able to control it, Turner says. Wen says that the environmental groups that are NGOs number in the hundreds, and each might have several hundred members. They cannot be too big, otherwise they would attract negative attention from the central government, says Wen, whose activities occasionally have been considered sensitive and pro-democracy. (The Chinese government has tracked pro-democracy activists since the Tiananmen Square protests in 1989.) More than 400 student groups, for example, with 50 to 100 members apiece, may join under one banner, the China Green Student Forum, but they remain separate organizations, sometimes with their own pet causes. Despite continued difficulties in gaining legal status (China requires NGOs to register, but they must be government-sponsored to do so), Wen says that environmental NGOs have more power and are becoming watchdogs that pressure government on certain topics. One such case was an effort to redirect a highway project slated to go through protected mangroves in southern China. Documents collected by local NGOs uncovered the local governments illegal actions, garnering attention from the media and citizens  and from officials at the national and provincial government level who intervened. Such incidents, along with some violent protests by villagers and communities downstream of chemical plants and other polluters, reported recently in the international press, are something that the Chinese government would like to avoid. The maxim First development, then environment, was a common refrain throughout the 1980s and much of the 1990s, wrote Elizabeth Economy in her book The River Runs Black. But Chinas leadership has also begun to witness the broader social and economic costs of its environmental failure, she wrote. More than 300,000 premature deaths a year can be attributed to air pollution, not including other health costs incurred, noted Economy, who is director of Asia studies for the Council on Foreign Relations in New York. The World Health Organization and the United Nations Development Programme estimate that such annual losses amount to up to $19.3 billion, accounting for up to 2 percent of Chinas gross domestic product. China has certainly almost every kind of environmental problem thats been invented, says Flavin of the Worldwatch Institute. But even though the country is using a lot of resources on the whole, usage is extremely low on a per capita basis, he says. The United States is using 10 times as much oil per person. If China approaches those rates, with 22 percent of the worlds population (versus the United States at 4.5 percent), then there will be reason to worry. Although oil remains much less important to Chinas economy than it is in the United States, says Lardy of the Institute for International Economics, the country is building highways at a prodigious rate. These thoroughfares already are thick with trucks for interstate commerce, particularly in coastal areas. Car purchases in the country have been steadily increasing, although only around 7.6 million cars are in the country, according to the World Resources Institute. EIA expects Chinas demand for oil to increase annually by almost 10 percent until 2010, when it will settle back to an almost 3-percent increase annually for the next decade or so. Lubick is a staff writer for Geotimes.